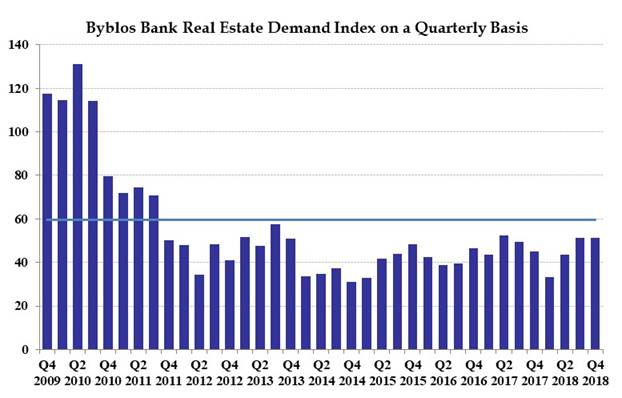 Byblos Bank Headquarters, February 19, 2019: Byblos Bank issued today the results of the Byblos Bank Real Estate Demand Index for the fourth quarter of 2018. The results show that the Index posted a monthly average of 51.2 points in the fourth quarter of 2018, nearly unchanged from 51.4 points in the third quarter of 2018 and increasing by 14% from 44.9 points in the fourth quarter of 2017. The fourth quarter results constitute the 20th lowest level in 46 quarters. Commenting on the results, Mr. Nassib Ghobril, Chief Economist and Head of the Economic Research and Analysis Department at the Byblos Bank Group, said: “real estate demand in the fourth quarter of the year was affected by the absence of concrete initiatives to stimulate demand in the real estate market, amid political uncertainties, stagnating consumer confidence and slow economic activity.” As such, the Index’s average monthly score in the fourth quarter of 2018 came 61% lower than the peak of 131 points registered in the second quarter of 2010, and remained 53.4% below the annual peak of 109.8 points posted in 2010. Also, it was 14.1% lower than the Index’s monthly trend average score of 59.6 points since the Index’s inception in July 2007. Mr. Ghobril noted that ”the government’s announcement in April that it intends to earmark LBP 1,000 billion on subsidized housing loans, the Parliament’s vote in September to allocate LBP 100 billion for subsidized mortgages, as well as the multiple draft laws that political parties submitted to Parliament to restore subsidies, raised the expectations of citizens that subsidized mortgages will resume on a large scale.” As a result, even though banks processed more than 1,000 mortgages in 2018, many citizens have delayed their purchasing decisions in the hope of a resumption of subsidies. The answers of respondents to the Index’s survey questions in the fourth quarter of 2018 show that 5.8% of Lebanese residents had plans to either buy or build a residential property in the coming six months, unchanged from the third quarter of the year and compared to 5.1% in the fourth quarter of 2017. In comparison, 6.7% of residents in Lebanon, on average, had plans to buy or build a residential unit in the country between July 2007 and December 2018, with this share peaking at nearly 15% in the second quarter of 2010. Further, Mr. Ghobril considered that ”the intentions of the Lebanese to buy a residential unit need a conducive environment in order to translate them into actual sales and transactions, which, in turn, requires immediate measures and incentives from authorities and stakeholders.” In this context, he stressed the need for the government to support demand through three practical measures. First, the government should reduce by 50% the registration fee on all purchased residential units for two years, not just on apartments whose price is $250,000 or less, as is currently the case. Second, authorities should develop the rent-to-own, or leasing, option for low-income persons, which is a more viable long-term solution than subsidizing mortgages. Third, the government should activate the LBP 100 billion in subsidized mortgages that Parliament enacted in September. In addition, stakeholders in the sector need to start promoting rent as a viable housing choice, as is the case in most other countries. The results of the Index show that demand for housing was the highest in the South in the fourth quarter of 2018, as 9.2% of its residents had plans to build or buy a house in the coming six months, compared to 9.1% in the third quarter of 2018. The Bekaa followed with 9.1% of its residents planning to build or buy a residential unit in the coming six months, up from 6.3% in the preceding quarter; while 6.3% of residents in the North had plans to buy or build a house, relative to 4.7% in the previous quarter. In addition, 3.8% of residents in Mount Lebanon intend to buy or build a house, down from 5.5% in the preceding quarter, while 3% of residents in Beirut had plans to build or buy a residential unit, down from 4% in the third quarter of 2018. In parallel, real estate demand decreased in two out of four income brackets in the fourth quarter of the year, while it increased by 17% quarter-on-quarter by residents who earn between USD 1,500 and USD 2,499, and by 16.2% by those who earn between USD 750 and USD 1,499.